Compare prices on car hire in Aarhus Tirstrup Airport from all the major brands and find the best deals. When you book through us, unlimited mileage and insurance are always included in the price given. Aarhus Tirstrup Airport (AAR) is Tirstrup, about 40 km northeast of Aarhus .The airport is the fourth largest in Denmark .The buses run between Aarhus and Aarhus Airport in direct relation to scheduled and charter flights, and bus trip takes about 45 minutes. Five major car rental companies are represented at the airport. 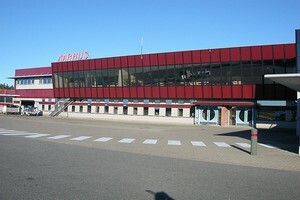 The airport can be reached via Route 15 from Aarhus or via Route 21 from Randers. In 2009, 526,402 passengers visited Aarhus Airport. From the airport, a journey of many charter destinations. Nine companies flying to and from the airport, the biggest being Scandinavian Airlines (SAS), Air and Sun Air / British Airways. The most popular routes are the Scandinavian capitals and London , Alicante and Barcelona .Originally, the airport was built in 1943 by the Germans and was a military base. Aarhus airport has duty-free, a few restaurants and shops and internet access for a fee. The terminal also has a VIP lounge and a separate conference room for 50 people.